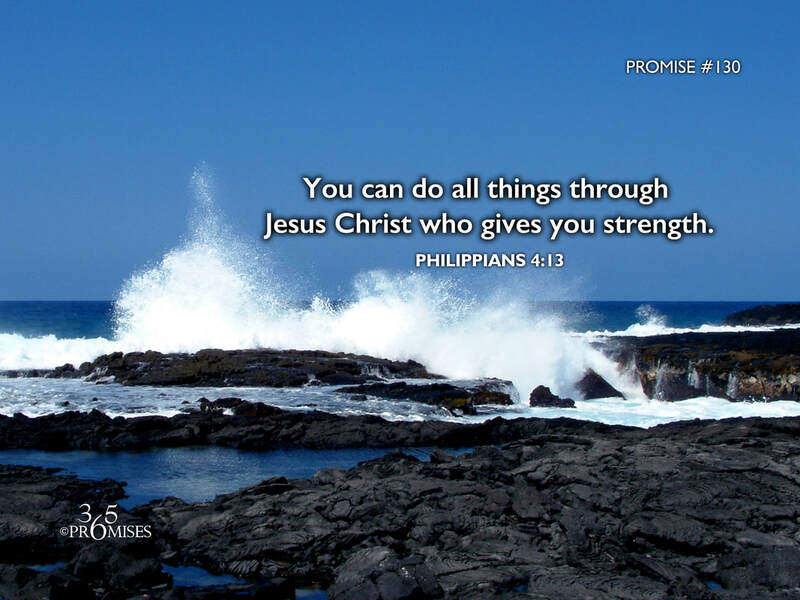 You can do all things through Jesus Christ who gives you strength. In yesterday's promise, we talked about the kingdom principle of weakness. In today's promise, we talk about the kingdom principle of strength. The reality is that they are one in the same. In Philippians 4:13, the Apostle Paul makes the bold declaration that he can do all things through Jesus Christ who strengthens him. The reason that Paul could say that nothing is impossible is because he had learned the secret that his own strength was made perfect in his weakness. (2 Corinthians 12:1-10) If we are leaning on our own abilities, then we can only do what we have the personal strength to do. If we realize the secret of our strength comes from us being empty of our own self-effort, then we will realize that there are no boundaries, barriers or limitations because Jesus knows no boundaries, barriers or limitations. No matter what life throws at us, we are more than conquerors through Him who has loved us. (Romans 8:37) If we embrace the humility of a childlike heart and understand that true strength does not originate with us but with Christ that lives in us, then we will believe that we can truly live an impossible life. May each one of us see the incredible power and strength that is available because we can do all things through our Elder Brother Jesus, who gives us His power and strength to overcome in every situation.